My kids love pizza and recently we were talking about Chicago Style Pizza. They had never tried it before so I decided to take a shot at making some gluten free. I reviewed lots of recipes online, but decided on a simple one using the Betty Crocker gluten free rice flour blend. Although my crust didn’t rise too much (I only gave it an hour so next time I’ll try it longer) the result was one of the best gluten free pizzas we’ve had as a family. The kids and everyone in attendance loved it. In a medium-size bowl or the bowl of your food processor, place the flour, xanthan gum, cornmeal, yeast, sugar and salt and stir or pulse to combine. To the flour mixture, add the 4 tablespoons of canola oil and the water in a steady stream, either pulsing in a food processor or mixing with a spoon or fork to combine. If you are using a food processor, pulse while streaming in the water, until a ball begins to form. Otherwise, stir constantly while streaming in the water and continue stirring until the mixture begins to come together. If the dough seems super sticky, add some more flour a tablespoon at a time, and stir or pulse to combine. Press the dough into a disk. Place the dough in another medium-size bowl and drizzle it with the olive oil. Turn the dough to coat it with oil. This will prevent a crust from forming on the dough while it is rising. Cover the bowl with plastic wrap and place it in a warm, draft-free area to rise until it is about 1 1/2 times its original volume (about 1 hour or more). After the dough has risen, wrap it in plastic wrap and chill for at least an hour. When you are ready to make the pizza, preheat your oven to 425° F. Grease well with canola oil a 12 inch round baking dish or a cast iron skillet if you have it. Press the pizza dough evenly into the bottom of the pan and up the sides, leaving a small clean edge toward the top of the pan so there aren’t exposed edges that can burn easily during baking. The corn meal will have made the pizza dough much less smooth and pliable than ideal, but it is worth it for the taste in the final product. Trust me. 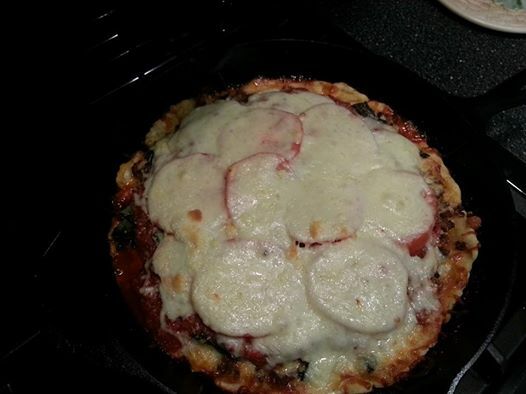 To assemble the pizza, use whatever ingredients you like. Slather the bottom and sides of the crust with softened unsalted butter. This will give the crust a nice buttery taste. Then layer in slices of cheese of provolone cheese then whatever else you like (I used cooked italian bulk sausage, pepperoni, fresh basil, bacon fresh sliced tomatoes, & mozzarella cheese), cover with tomato sauce and a thin layer of finely grated Parmesan cheese. Tent the pan with aluminum foil, and place it in the center of the preheated oven. Bake for 20 minutes, uncover, and bake again until the sauce and cheese are bubbling and the crust is nicely browned (about another 10 minutes). Cool in the pan for at least 10 to 15 minutes. Serve right away. Put everything in the pot and simmer for a good hour for the sauce.